Fishing is a fascinating hobby and useful hobby, and the more competent fishing secrets you learn, the more productive it will be and the more your catch. Today many fishermen use to catch fish with a ground rod with an end load. In this article we will tell you how to tie the leash to the main line using a variety of methods available to any angler. The simplest method of tying the leash to the line is attached to the main fishing line a few pieces of insulation. Wear on the line as many pieces as you leads going to it to strengthen. On the main fishing line tie a loop so that sleeve was caught between two loops. Another method involves creating a detachable leash. Make a separate leash and hook it on the end of a carbine. With carabiner leash if necessary, is attached to the main line using a loop. Also you can make completely removable tackle – for this you will need two carbine on both sides of the gear which is fixed a fishing line with a leash on the main fishing line with one hand and depreciation on the elastic band on the other hand, and at the end of the fishing line rifles unfastened and removed. Attach the carabiners properly – tie some loops by the number of leashes on the main fishing line using a double knot. At the ends of leashes you tie the same loop. Attach the leash to the line by the "loop the loop". You can also use an ordinary button, which is put on in advance of main line. Left and right buttons on the line tally additional nodes, and the button is attached to the leash. If you are going to catch small fish, make a simple leash method of the split loop. 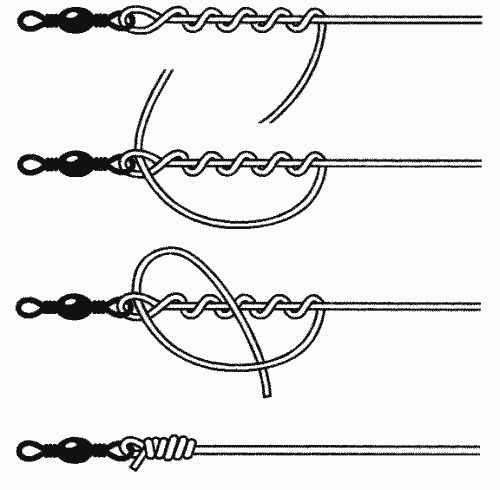 Tie loop on the main line, and then cut one of its edges, and by the end of the loop tie a hook. In order to tackle served for many years, use a triple swivel, which improves the durability and quality of fishing. The distance between the leads when installing the donkey do at least two lengths of leashes. The length of the leads themselves must not exceed 30 cm.